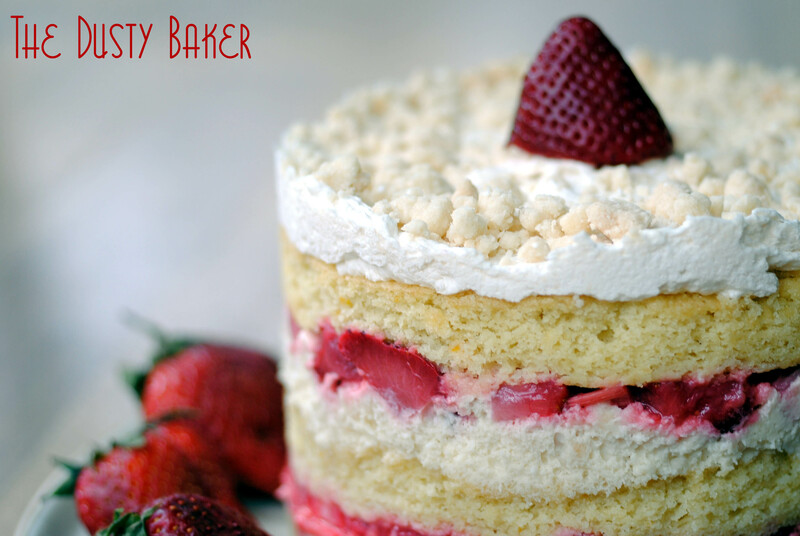 Strawberry Rhubarb Layer Cake – Happy Birthday Mom! Layers of Meyer Lemon Cake (gluten free) with strawberry rhubarb compote and (dairy free) liquid cheesecake! She is the only person who reads almost every single thing I write. She’s seen every show that’s been important to me. She can really shake it on a dance floor. Her generosity knows no limits. She has an infectious smile. She is constantly learning, evolving, growing, and never giving up. She has spent years figuring out how to cook for me, with so much success. 60 miles in Twin Cities. A convertible and pink boas for all those other 60 miles. She flew to Tampa to surprise me after my 60 miles there. She knows my limits and helps me not to cross them. She’s a boobslinger, with pride. She can rock a red hat. She gave me my big sister. She gave me my little brother. She gave me my little sister. I see my entire life whenever I decorate my Christmas tree. She’s a great show-partner… and a brave one. She’s seen me partially clad onstage (twice) and commended me for both performances. She always sends a card, just when I need it, for no reason other than she knows I need it. She truly loves my pets and helps me best care for them. She’s by far my favorite person to shop for clothes with. Some of my most beloved things were gifts from her. She can talk to anyone, and with genuine interest and respect. She’s just plain beautiful, outside and in. Dozens of now-adults still call her “mom”. She’s stepped in to sew, drive, cook, clean, pack, move, promote, organize…. she’s Everywoman. She made those awkward teen years exponentially less awkward. Even though we sometimes view the world very differently, she always listens to what I have to say and never responds with judgment or disappointment. She is endlessly curious about the world around her. She puts people above all else, especially when you need her to. She knows when to coddle, and when to let go. She cries with me when the world is too big for both of us. She sings with her whole heart. She worships with her whole heart. She’s an incredible travel companion. She sees her fears and lets those who love her help her overcome them. She’s flown and driven countless miles, just to be there when you want her. Her biscotti will always be better than mine. She still comes to doctors appointments with me when I’m too sick to go alone. The woman can rock a karaoke night. You never leave her house without leftovers… no matter how old you are. She takes care of her parents with no complaint. People remember her for her joy, her laugh, her twinkling eyes, her friendship. She naturally inspires loyalty and love. She steps up, every single time. She’s a true, true friend, as well as an incredible mother. I wish her much, much love and happiness in this, her 59th year. I pondered several recipes for her celebratory cake, then found rhubarb at the market. Strawberry rhubarb is one of our favorite pies. I took it as a sign. Place a 6″ cake ring on a plate on top of a piece of parchment. Prepare a piece of acetate 6″ high, fitted to the ring. Use the ring to cut out two circles of Meyer Lemon Cake. Use the scraps of the cake to fill in the bottom of the ring, pressing down with the back of your hand to form an even layer. Use a pastry brush to wash with some Rhubarb Simple Syrup. Spread 1/2 of the Liquid Cheesecake evenly on top. Sprinkle with 1/3 of the remaining pie crumb, and tap down to secure. Top with 1/2 of the Strawberry Rhubarb Compote. Gently top with one of the cake circles. Fit the acetate ring gently in, coming just below the cake layer. Repeat with more simple syrup and remaining pie crumb, Liquid Cheesecake and Strawberry Rhubarb Compote. Top with second cake circle, frost with Pie Crumb frosting and sprinkle with remaining Pie Crumb. Freeze overnight, and remove to fridge to defrost at least 6 hours before removing cake rings and serving. Preheat oven to 350°. Fit a half-sheet with Silpat or parchment. In the bowl of standing mixer with the paddle attachment, paddle all dry ingredients on low until fully combined. Add butter in a slow stream and paddle until crumbs form. If too dry, add water slowly until the batter starts to pull into crumbs, but before it pulls into a dough ball. Bake for 25 minutes, tossing halfway through, until slightly firm. Cool completely before using. Heat water and sugar in a heavy-bottomed pot on medium heat, whisking sugar to dissolve, and bring up to a low boil. Meanwhile, trim ends of rhubarb and, if desired, peel of thick outer layer. Quarter thick stalks length-wise if needed to make a uniform thickness, then dice into small pieces, about 1/2 inch. Toss rhubarb in simple syrup and cook on low heat until soft, about ten minutes. Strain, reserving simple syrup in a heat-safe bowl or Pyrex measuring cup. Chop strawberries into 1/2 inch dice, and stir into rhubarb. Stir until the rhubarb breaks down and forms a sort of coating around the strawberries. Put aside to cool completely. Heat oven to 350°. Line a quarter sheet pan with parchment paper (I put a dab of cooking spray underneath to hold it in place, but don’t grease the top). Measure out dry ingredients in a small bowl and whisk thoroughly. Whisk in the lemon zest. In a small pot over low heat, whisk the eggs and sugar. Keep whisking while the eggs slowly warm, being careful not to let them curdle. Once just above room temperature, transfer to bowl of standing mixer with the whisk attachment. Beat on medium/high speed until doubled in size and incredibly fluffy, about 4 minutes. Fold in the dry ingredients, turning the bowl and gently incorporating together. Add the butter and lemon juice and fold until completely incorporated and smooth. Pour onto sheet pan and smooth the top. Bake for 20-25 minutes or until set in the center. Cool completely before cutting and filling.